Lovely 3 bedroom shingle style house tucked away on a quiet side street in town. Upscale finish details and furnishings with an open floor plan, a living room with a fireplace and large porch plus a spacious finished media room in the basement. Landscaped yard area includes a grilling deck and shelled parking area for two cars creating minimal yard care. 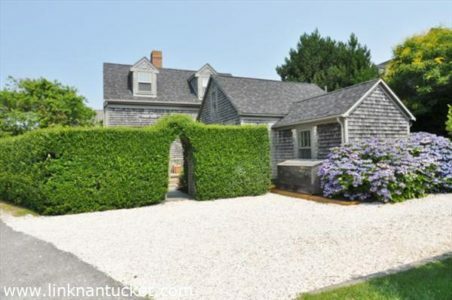 Easy access to bike path leading to Cliff, Dionis and Madaket Beaches. Offered mostly furnished. Lower Level Spacious finished media room with a large TV and roomy & comfortable sectional sofa (includes Queen sleeper pull out) with a leather ottoman for relaxing while you are watching your favorite show or game. Laundry nook, storage room and doorway access to outdoor storage area and side yard.